Time to Rhyme and Play Today? 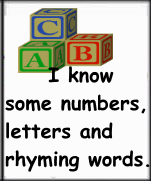 Strange as it sounds, familiarity with rhyming words gives lot of information about children’s development. It is an important brain milestone. One way to explain is to compare rhyming words to a car engine’s sound. A mechanic can tell if a car is running well by listening to the noise when the hood is up. If all parts of the engine are working as they should, the engine almost purrs. In the same way, we can listen to a child’s engine—the brain. Well, we’re not listening to the brain, but to the words a child uses. We can give kids two words like boat and train and ask them to choose which one sounds like coat. “Does boat sound like coat, or does train sound like coat?” The word-noise they choose tells us what’s happening at a brain level. The ability to choose words that rhyme indicates the brain has figured out how language and words work. Each word is made of tiny bits of sounds put together like puzzle pieces. The words hat, bat, cat, rat, sat, have parts that sound the same and a really small bit that’s different. We don’t teach this to kids. They figure it out by themselves. This skilled is called phonological awareness. 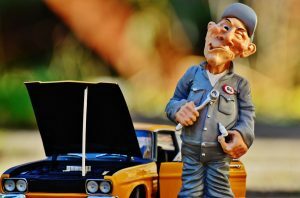 If a car engine isn’t ticking along as it should, the mechanic checks it over. 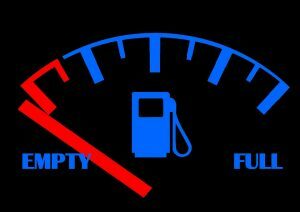 One of the items to troubleshoot is if the engine is getting the proper amount and mixture of fuel. The brain is an engine and in the case of rhyming words it too needs fuel. That is, hearing and using lots and lots of words. Some powerful research discovered that kids hear millions and millions of words a year. (Hart and Risley) Between 3 and more than 10 million. By the time kids are 3 years old, that’s about 10 million to 40 million words. Like the engine and fuel, which brain is going to make the connection? The brain that’s only been exposed to 10 million words, or the one that’s been filled up with 40 million words? Read books. The same book read over and over does count, but reading a variety of books gives a wider vocabulary. Every now and then, pause and let your child guess the next word. Tell stories. Make up your own stories. Tell about when you were a child, what your brothers and sisters did, what you liked to do. Together, create an adventure for the bus when the driver is a zebra. Have conversations. You may need to supply most of the words when talking to kids. They don’t know as many as we do. You can also have conversations with things. Be the voice of the fork as it talks to the spoon on the table. Talk and eat. Eating meals together as a family is food for bodies and fuel for brains. Kids hear so many words around the table as adults talk to kids and to other adults and kids talk to kids. There’s also a context in these shared conversations that gives a richness to the words. No calories for this icing on the cake. Sing. Songs are another way to use words. Very often, there are rhyming words in the lyrics. Don’t worry about your voice. Kids listen with their hearts. A mechanic doesn’t give an engine flash cards. We don’t instruct an engine how to run. We can’t tell a brain how to make connections and thinking pathways. We can provide the stimulation, the fuel so the brain develops familiarity with rhyming words. For kids, these are experiences and opportunities. The gas mixture needs to be language rich. How do you fill up your child’s brain tank? For a play-of-the-day, how about some word play for kids, a la Dr. Seuss? 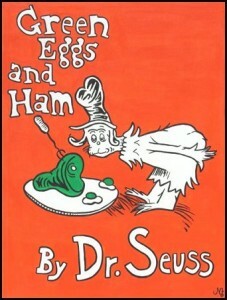 Books written by Dr. Seuss have been loved for decades. They are full of fun and play, especially word play. What a great way to celebrate Dr. Seuss. Dr. Seuss stories have wonderful rhymes. Sam-I-am’s determination not to eat green eggs and ham in a box or with a fox, in the rain or on a train, or any of the places here, there, or anywhere creates sounds that are almost musical. Even if kids have not yet made all the brain connections to understand rhymes, the word play in Dr. Seuss tickles their ears. At home, you and your child can have your own fun. Put on each sock and go for a walk around the block with a rock in your pock-et. . When your child says something, see if you can answer with words that rhyme. “There’s a tree, my eyes can see. It’s waving at me.” As kids get dressed, you can choose a color and add some words that sound the same. Green-bean, bed-red, blue-shoe. Orange and purple unfortunately are on their own. They have no rhyming friends. Some children will be able to think of a word that rhymes about the age of four. If your child can do so, you can suggest a word and let your child think of a match: bee, tree, knee and ___. Make up several words in a row and throw in a very different one to be silly, like bat, cat, mat, rat, sat… alligator. This can give rise to giggles. Dr. Seuss books used words in imaginative ways. His elephant-bird and Christmas roast beast are ordinary words in unusual combinations. The trunk of a vehicle could be a car-back-pack. The hood is a sort of engine-lid. Made up words, like Lorax, sneetches, and Grinch, are another way to play with words. Kids are great at coming up with their own words for things. This really will cause giggles as kids think it’s all wonderfully silly. Silly, certainly, but very much more. Kids need to hear words in massive amounts to develop the understanding that words are bits of sounds that we put together. These bits of sound are like the very smallest Lego bricks that join together to make useful chunks. Changing one little itty bit in a string can make a whole new word. This is called phonological awareness and is a challenge for brains to figure out. Having lots of language stimulation trains the ear to hear very small differences in sound. It also trains the brain as it makes vast connections for words and sounds. Word play for kids is more than fun, it’s great exercise for brains. Say, can word play be part of your day? 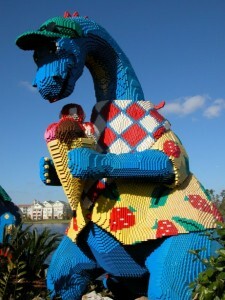 Dinosaurs are great toys for learning. Last week, they helped with letters as kids dug them out of sand. 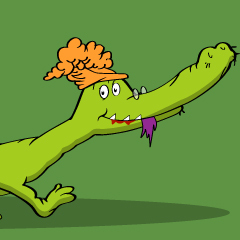 This week, how about a fun dinosaur word game? Letters have both names and sounds. Long before kids learn the names of letters they can have fun with sounds. Have you ever made a mistake reading a favorite story to a child and been corrected when you said a word wrong? Kids may not even be able to pronounce all sounds accurately but they know what words should sound like. Dinosaur start with the ‘duh’ sound. So does dad, dog, and dish. When talking about dinosaurs, you can say the word dinosaur and then another d word and say something like, “Hey, did you hear that? Dinosaur and door both start the same. Duh, dinosaur and duh, door. Duh, duh, duh. I wonder if I can think of any thing else like that? Oh, oh. I got some dirt on my hand. Dirt. Dirt starts duh. Dinosaur, door, dirt. Wow that’s lots of duhs.” Some kids will not yet have developed the skill of dividing words into their little sound bits, but no matter, it starts to clue the brain into listening to different sounds. For some fun today, play the word game Stuck on Dinosaurs. That is, use the ‘duh’ sound incorrectly. For example, in the kitchen ask your child if it’s time for dunch. You can notice you made a mistake and realize you meant to say lunch not dunch, but you were stuck on dinosaur. Some other possibilities could be looking for your dlasses (glasses) or maybe your docks (socks). When kids catch on, they think this is pretty silly but very funny. You can even call your child by the wrong dame, er…name. Anyone for dice cream? 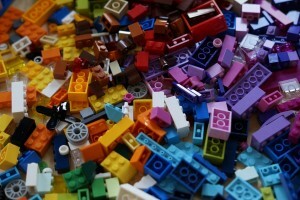 Kids need to hear millions and millions of words for the brain to figure out that words are made up of bits of sounds. This is called phonological awareness and it is a critical skill for reading. Taking advantage of opportunities to play word games with kids will encourage listening for tiny differences in sounds and help brains understand how sounds work. Sounds are like puzzle pieces that get put together in various ways. The sounds that words start with is one of those ways. 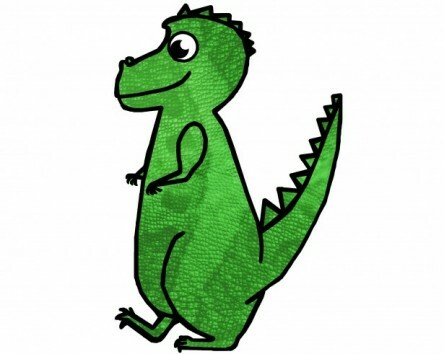 Can you play the Stuck on Dinosaur Word Game with your child? P.S. You can get stuck on 123kindergarten on FB and play anytime.